This article is by Anand Iyer, former Head of Product at Threadflip. He tweets at @ai. In 2009, Airbnb was close to going bust with revenue flatlining at $200 a week. Since then, over 9 million people have used it to find temporary housing. Etsy was founded almost a decade ago, but doubled its valuation with its last two rounds of funding. The gradual but ultimately huge success of these entrants to the marketplace space has paved the way for Uber and Lyft’s breakout growth, and the explosion in startups with marketplace models: Postmates, Getaround,Taskrabbit, and more — quickly eclipsing the old guard represented by Craigslist. Marketplace startups are unique because they aren’t just serving one base of customers. They connect buyers and sellers, service providers and consumers. They have to make sure users are having a good experience with each other as well as their company. As head of product for fashion marketplace Threadflip, it's remarkable to me how much of this is based on our ability to inspire and maintain trust. And while "trust" sounds like a subjective term, building it is highly tactical. Let’s take a closer look at Craigslist. As a consumer, you conduct a search, you email sellers or providers, you keep track of who you email, you schedule pickups and oversee transactions yourself. You do all of this despite a high degree of anonymity, a poor mobile interface — neglecting the spike in mobile engagement — and no guarantees. How much more would you be willing to pay to save time and gain assurance? This is where marketplace startups are finding opportunity. However, for a marketplace startup to win, it needs to hit liquidity as fast as it can. Liquidity is such a powerful force, it's the reason most marketplaces and, more generally, network effect businesses like Craigslist, aren’t easily disrupted. That said, it’s increasingly clear that buyers and sellers are looking for better structure. More users want platforms to do all the work for them. This is why highly verticalized plays are becoming compelling for investors. When you focus in on a very specific area, like Homejoy focuses on house cleaning, you have a better chance of serving all of that market's needs and differentiating. As a startup leader, your job is to make sure your customers trust you to meet and constantly exceed these needs. To do this, well-managed marketplaces prioritize the following features. Most have star-rating systems built somewhere into the process for both buyers and sellers. For example, Uber, Flywheel and Lyft ask both drivers and passengers to rate their experience at the end of a ride. To actually make this data valuable, however, companies have to use ratings almost imperceptibly to filter out bad users and continually improve service. Uber users don't want to spend the time sifting through drivers’ ratings and reviews. You expect that the company has already removed poorly-rated drivers from the system. You’ll never see a driver with lower than a 3-star rating on Uber, and as a result, very few riders worry about having a bad experience. The corollary is that drivers can depend on the system to weed out abusive or fraudulent passengers. On both sides, ratings help people trust that they will get what they are expecting. With so many choices, users don’t have the patience for any questionable content. For us, this means damaged or overly used clothing listed on Threadflip, but also includes crummy apartments on Airbnb — or even a clunky checkout flow on a website. Customers will go elsewhere, and fast. As a marketplace curator, you have to do two things to prevent this from happening: You need to hire people to continually find and feature your best content and downgrade or eliminate the bad content. You also need to create community-facing tools so your users can do the same thing. Airbnb is a prime example. While shady apartments may get listed, they are extremely hard to find. Generally, the best listings are surfaced first as a result of both manual and algorithmic curation. As a marketplace company, manual or editorial license is a big lever to retain users. Airbnb discovered this when it replaced user-generated apartment photos with beautiful, professional-quality photos. Even though this strategy didn't scale, and now most photos are in fact user generated, it helped them create helpful guidelines for people listing apartments, which gave them the lift-off they needed. A human system that learns like a machine. All of these marketplaces may be enabled by technology but they are powered by people. This means two things: Users expect service to be fast, infallible and continually improving — much like software — but they don’t want the brand to be robotic; they want to know that real humans work there and care. At Threadflip, our team learned that people don’t want to wait more than 10 days for a product that they’ve ordered from someone. This is a threshold we defined by looking at natural human patterns. People generally don’t have the time to ship something during the week when they're working, so they wait till the weekend. This gives sellers a 7-day grace period to get the package in the mail. But once 10 days have gone by, buyers start to report bad experiences. After collecting this data, we took quick, precise action to enforce short ship times. Now we not only send emails to both buyers and sellers with the 7 to 10-day expectation clearly outlined. We also mail shipping labels to sellers so they only have to slap them on flat-rate boxes to send their products, and to encourage them to do so within the 10-day window. 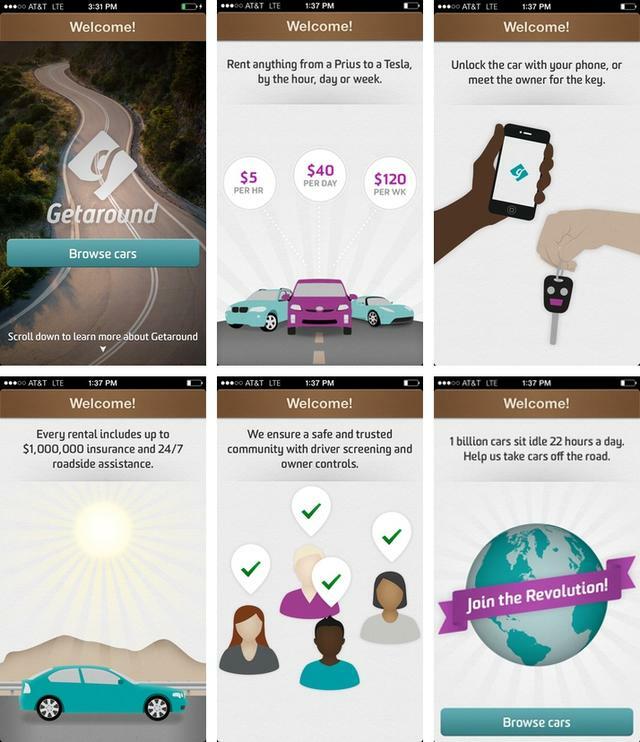 Lyft is another company that has taken action to craft a more human experience. While ride-sharing has become more automated and, one might argue, increasingly robotic, Lyft has responded by equipping drivers with phone chargers so they can give riders a chance to juice up while in transit. They also recommend that drivers make conversation if riders are open to it, and of course offer the signature fist bump. This effort to make customers feel like part of a community is a pillar of the company’s initiative to build trust. Most importantly, when expectations are violated on either side — a buyer is left hanging, or a seller never receives payment — companies should deploy a very human-centric customer service strategy, heavily reliant on phone calls and personal communications from employees. Homejoy, for example, follows up when poor experiences are reported with phone calls and discounts. Personally, I will always remember the one time I gave a ride-share driver a 3-star rating. Almost immediately, I received an email from a named customer service rep asking for more information about the experience and making it clear that she would pass along my feedback to the driver operations team to make a difference. As a result of this humanizing experience, I am still a happy and retained customer today. To be successful, marketplace companies need to focus on their suppliers — the sellers and service providers on the platform that make their offering possible. This can be counterintuitive for a lot of startup leaders who are focused on pleasing traditional end users. But for buyers, very little is actually out of the ordinary. Most people are used to buying or even ordering services online, either from Amazon or eBay. On the flipside, fewer people are used to shipping products, providing taxi service, or turning their home over to other occupants. For all these reasons, it’s crucial that marketplaces focus first on devising an elegant, instructive and — above all, easy — experience for suppliers. Just like Lyft provides its drivers with phone chargers and a playbook for how to be a good and courteous driver, our team at Threadflip will send sellers shipping supplies like boxes, and even free mannequins to help them display used clothes. (Interesting fact: People are much more likely to buy used clothes they see on a mannequin than on a real person — data that Threadflip collected and distributed to help its seller base.) By creating digestible and inclusive materials for sellers, we have been able to inspire loyalty and turn sellers into evangelists for our brand. Another best practice is to set up forums or community spaces where sellers or service providers can connect directly to share challenges and best practices. For example, Airbnb hosts feedback forums so that hosts can talk about what has worked best about their listings, and how to be the best hosts possible, including providing fresh towels or a stocked fridge of treats. At Threadflip, we actually started out focusing much more intently on the buyer experience, but shifted our strategy when we saw a dramatic difference between our buyer and seller net promoter scores. Sellers clearly needed more support. In response, we built dashboards to track how much money top sellers have been bringing in over the last 7, 30 and 90 days. This helps us keep tabs on all of our top sellers and influencers so we can solicit their feedback and build stronger personal relationships. For the very top sellers — the ones who appear consistently on all these lists — our leadership team holds regular one-on-one calls to see what they like about the experience and what we could be doing differently. Whenever a new top seller pops up on our radar, we try to set up a call to get fresh thoughts on what could be improved immediately. In addition to gathering feedback, we've also made a strong effort to provide sellers with the analytics they need to understand the ROI on their actions and do better business. By tightly coupling product operations and customer service, we've been able to immediately respond to seller feedback. The product changes that came out of making supply-side a core value ultimately improved our seller net promoter score by 70%. There are three areas where marketplace startups can invest more energy to make big gains: mobile development, payment processing and user introduction flows. These should be top priorities for your product and engineering teams if they aren’t already. As Benchmark Capital's Bill Gurley wrote in his piece "All Markets are Not Created Equal," there is tremendous opportunity for mobile technology to add value and enhance user experience. Well-designed mobile apps can go a long way toward reducing work for participants and increasing the cost of switching to another platform. On top of that, the bulk of new marketplace users are millennials, and the majority of them access the apps they use exclusively through their smart phones. If you're a technical leader at one of these startups, your team’s core focus should be to build a simple app that caters to both suppliers and consumers no matter how tech savvy they may be. Again, this is an area where sellers and service providers are too often an afterthought. I once used an app to find a handyman to fix some things around the house. It turns out this company communicated jobs to its corps of handymen by texting numeric codes. For example, a 4 might be a very serious problem — but it could be a plumbing problem or an electrical problem. The code gave no indication of the tools a handyman would need to bring along, leading to a bad user experience on both sides. The company had the opportunity to take much better advantage of SMS but failed to do so. On the other hand, delivery service Postmates has capitalized on the mobile platform by providing an easy-to-read map showing exactly where delivery people are and what phase of the job they are completing. This goes a long way toward solidifying trust by borrowing familiar mobile formats (maps) that people are already used to. 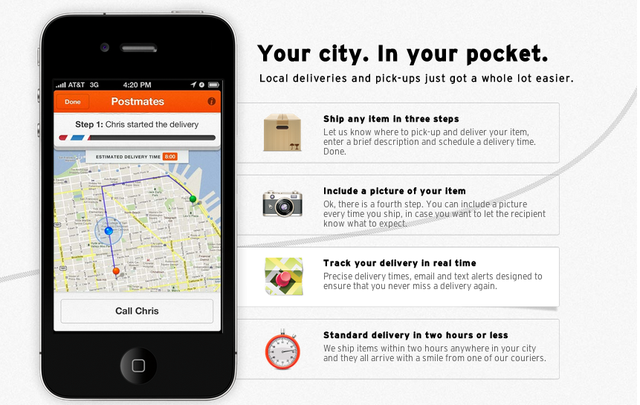 At the same time, people ordering through Postmates can call or text couriers at any time. One of the biggest reasons Craigslist is losing ground to new marketplaces is that payment isn’t integrated into the product experience. Most people pay in cash, prices are bargained up and down, and there’s no guarantee on either side. Companies like Uber and TaskRabbit have won by making people trust them enough to store their payment information, making every transaction absolutely seamless. There’s never any concern that a form of payment won’t be accepted or will present some sort of last-minute problem. The more technology can be leveraged to make payment an invisible process, the better. When Amazon introduced one-click payment, it upped its annual revenue by an estimated $2.4 billion a year. People enter their information once and never have to worry about it again. Now companies like card.io, are making it even easier by allowing users to simply snap photos of their credit cards to snag the data. Payment company LevelUp saw sales jump 13% when it integrated card.io's scan-based checkout experience — but innovation could be pushed even further in this direction. For an app to succeed, users need to see why it would be valuable to them immediately. Marketing should not be about why a product is good, it needs to be about the benefit to users on both sides of the buyer/seller divide. This is why snappy, witty, and brief introduction flows are so vital. Netting a retained, vested user for your mobile app is arguably harder than building the product itself. But there are a few things that can ease users into the top of the funnel. Getaround, for example, isn't the simplest concept — it makes other people’s cars available for rental. However, when you first download the app, it walks you through several very simple, instructive screens that tell the story and drops you off at a place where it’s easy to get started. Note the direct use of the word “trust.” By baking trustworthiness into users’ very first touchpoint with your product, you not only build a solid relationship between them and your brand, but with each other as they exchange goods and services. Never shy away from being direct or emphatic about this. Ultimately, marketplaces are social businesses. They depend on relationships and network effect. That’s why you can drastically lower the barrier to entry for new users and increase conversion by leveraging social proof — basically promoting that many other people are using and loving your product. As Aileen Lee has said, social proof is “a relatively untapped” goldmine in the age of the social web. And it can come in all shapes and sizes. It doesn’t have to be purely about how many people are using your service — the quality of your users is much more significant. And when it comes to anything social, quality is equated to how well you know someone. For example, Airbnb uses Facebook data to surface how many friends a user may have in common with the host at a particular property. This is cleverly designed to make users feel like they know the host themselves, or that they are the same type of people. They will be that much more likely to rent a property. The question then becomes, what if your marketplace is so young that you don’t have a large volume of users to play with? 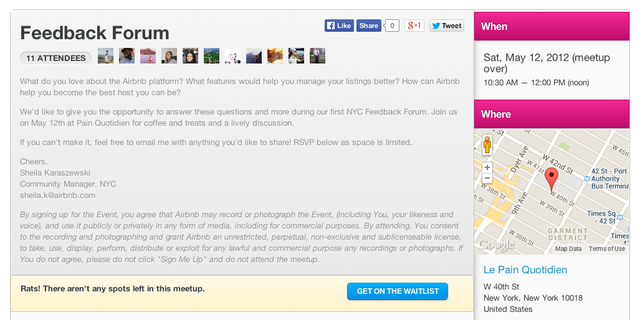 How do you build social proof from scratch? The answer is: Don’t underestimate the power of even a few testimonials and positive quotes — especially if you can feature people who would be identified as influencers by key communities. The best move is to connect these words of support with the faces of real people. There’s something about identifying with people’s photos that takes social proof to the next level. This is how Facebook cemented its user retention strategy, by showing the faces of people a user might know right under the login button. Following this lead, the product team here at Threadflip integrated people’s faces into the welcome flow of our mobile app. For marketplaces, it’s important to realize that social proof isn’t only influential for buyer-side user acquisition. In fact, it moves the needle even more to show sellers and service providers that other people just like them are deriving a ton of value from your platform. They are the ones who are more likely to be going out of their way or trying something new. The more you can use other users’ stories to demonstrate how easy and lucrative your marketplace is, the more secure your supply will be. And in the end, supply is your key to liquidity. Anand Iyer was Head of Product at Threadflip. Previously, he was Co-founder and CTO of Hitpost, acquired by Yahoo, and managed product at IGN Entertainment and Microsoft.